The World Poker Tour proudly welcomes Paul Petraglia (pictured), Jacksonville local, to the prestigious WPT Champions Club! Petraglia topped the 323-entry field in the Season XVI WPT bestbet Bounty Scramble Main Event to capture his first WPT and the $315,723 first-place prize. Petraglia defeated Sam Panzica in heads-up play and denied the defending WPT bestbet Bounty Scramble Main Event champion his third WPT title. On the final hand, Petraglia opened with a raise to 350,000 with the blinds at 75,000-150,000 with a 25,000 ante. Panzica made the call, and the flop came down . Panzica checked, Petraglia bet 400,000, and Panzica check-raised all in for 2.35 million. Petraglia made the call with the for a flopped straight, and Panzica was on the ropes with the . The turn was the and the river was the to give Petraglia the victory. *First prize includes a $15,000 seat into the season-ending WPT Tournament of Champions. A pilot by trade, Petraglia was by far the least experienced player to reach the final table if you only looked at the tournament résumés of the final six competitors. Petraglia had never cashed in a WPT event – just a WPTDeepStacks event – and his largest live tournament score was for a little more than $20,000. As a corporate pilot, Petraglia was undoubtedly flying high after the win, but he doesn’t see himself leaving his career to become a poker player anytime soon. Petraglia told WPT.com that he has played a few WPT events before. He just hasn’t cashed in one yet. His first World Poker Tour cash is now a victory, and he joked that he coworkers probably won’t believe them when he tells them. 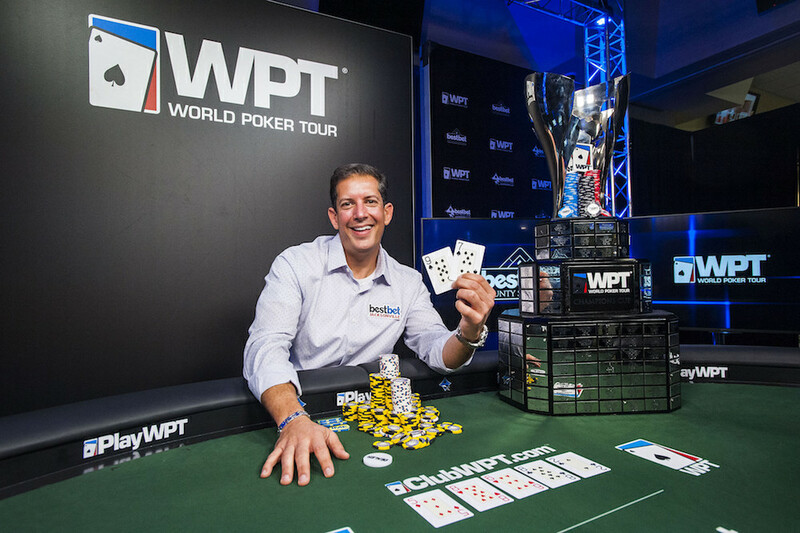 In addition to winning the lion’s share of the prize pool, Petraglia won a $15,000 entry into the season-ending WPT Tournament of Champions. With a payday of more than $315,000 and a chance to go on to do even bigger things in the season-ending WPT Tournament of Champions, there isn’t much that would make this victory sweeter. For Petraglia, though, winning the tournament at his home casino proved the icing on the cake. With the victory in Jacksonville, Petraglia grabbed 1,000 points in the Hublot WPT Player of the Year race for Season XVI. That moved him into a points tie with six others, but the tiebreaker is money earned, putting Petraglia in eighth place officially. There are nine WPT Main Tour events currently scheduled for Season XVI of the World Poker Tour, so Petraglia will have plenty of opportunities to chase down the current leader in the Hublot WPT Player of the Year race, Art Papazyan. Papazyan stands well out in front of the rest of the pack with 2,400 points thanks to two WPT victories this season. Papazyan first won the WPT Legends of Poker Main Event for $668,692, and then he went on to win the WPT Maryland at Live! Casino Main Event for $389,405. Papazyan will undoubtedly be a tough man to catch in the race, but it’s a long season. Last season, Hublot WPT Player of the Year winner Ben Zamani jumped out to a huge lead early on, but the race came down to the wire at the final stop of Season XV at Seminole Hard Rock in Hollywood, Florida. Speaking of the Season XVI schedule for the World Poker Tour, next up is a trip to Canada for WPT Montreal at Playground Poker Club. The full WPT Montreal festival of events begins Sunday, October 29, and the C$3,850 Main Event starts on Friday, November 10. With three starting flights and a C$2 million guarantee, the WPT Montreal C$3,850 Main Event is an event you don’t want to miss! Looking to win your way to a World Poker Tour event for your shot at becoming a WPT champion? Play for your chance on ClubWPT.com, where eligible VIP Members can play for over $100,000 in cash and prizes each month, including seats to WPT events, no purchase necessary.